Columbus Blue Jackets' Artem Anisimov, of Russia, celebrates his goal against the Florida Panthers during the second period. 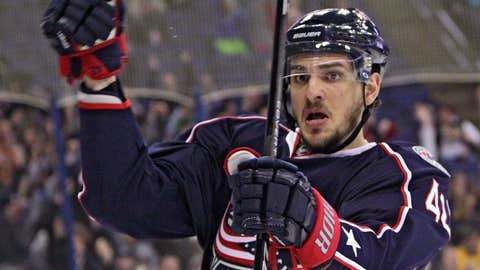 COLUMBUS, Ohio (AP) — Artem Anisimov scored a short-handed goal late in the second period and Columbus’ special teams provided four goals in the Blue Jackets’ 6-3 win over the Florida Panthers on Saturday. David Savard, Cam Atkinson and R.J. Umberger added power-play goals — the Blue Jackets were 3 for 4 with a man advantage — while Jack Johnson had three assists. Savard also had an assist. Shawn Mathias and Nick Bjugstad each had a goal and an assist and Sean Bergenheim also scored for the Panthers, who lost their fourth in a row and have dropped seven of eight. Nick Foligno, playing in his 450th NHL game, had an empty-net goal, as did Matt Calvert. It was Foligno’s 200th career point. The Panthers, last in the NHL on both special teams, failed to kill five consecutive penalties over two games. The Blue Jackets had a man advantage twice in the first period and scored both times. James Wisniewski’s hard shot from the top of the right circle handcuffed Scott Clemmensen, who finished with 31 saves, with Umberger there to jam in the rebound on the power play at the 7:42 mark. No sooner had that goal been announced than Scott Gomez went off for interference. This time, the Blue Jackets scored with just one second left in the power play when Savard’s wrister from the right point was redirected by Atkinson. It was Atkinson’s 18th goal. Johnson, whose whiff on a power-play shot from the point resulted in a costly short-handed goal in Thursday night’s 5-2 loss at New Jersey, assisted on both goals. The Panthers countered late in the period when Wisniewski’s pass went right to Matthias in the neutral zone. He then streaked up the left wing, went wide to get past Wisniewski, faked and then tucked a shot inside the near post on Bobrovsky. Columbus had 11 of the first 12 shots in the period, but Florida had the final four. Each team scored twice in the second period, with the Blue Jackets adding yet another power-play goal and then scoring on a Florida power play late. Bjugstad won a puck battle with 20-year-old defenseman Ryan Murray at the blue line and then coasted in with plenty of room to move, eventually deking Bobrovsky to the ice before lifting a backhand for his 14th at the 6:54 mark. The Blue Jackets regained the lead with a man advantage at the 10:50 mark, Savard carrying the puck from the right boards unimpeded to the slot where he flipped a backhand past Clemmensen for his fourth. Forty seconds later, Bergenheim blocked the vision of Bobrovsky on Tom Gilbert’s slapper from the right point, then converted the rebound for his 14th. With the Panthers on the power play after Derek MacKenzie went off for a high stick, Anisimov scored. He skated from the left boards, behind the net and to the far wall to force a turnover by Jonathan Huberdeau. The Russian Olympian then skated with the puck to the crease past Gilbert, got Clemmensen to commit and then scored on the forehand. It was his 15th of the season. Notes: D Fedor Tyutin, expected to be out two to three weeks with an ankle injury suffered while playing with the Russian Olympic team, missed his second game for the Blue Jackets. … The Panthers were opening a three-game road trip; they play at the Islanders on Sunday, then at Boston on Tuesday. … The Blue Jackets came in 8-2-0 when scoring at least two power-play goals in a game.